For the reduction: Combine the cranberry juice, sage, bay leaves, honey and a pinch of salt in a small saucepan. Bring to a boil and simmer until reduced to a thin syrup (about 1 tablespoon), 4 to 5 minutes. Let cool, then discard the sage and bay leaves. 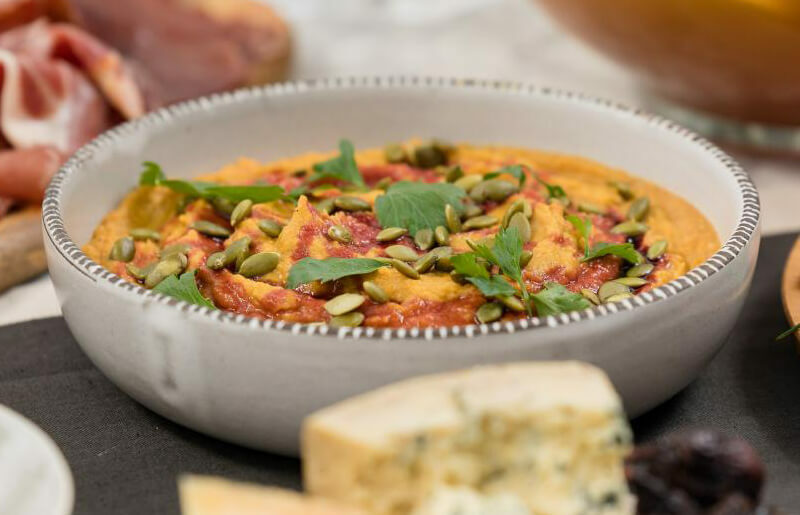 For the dip: Combine the beans, pumpkin, orange zest and juice, pumpkin pie spice, cayenne and 1/2 teaspoon salt in the bowl of a food processor. Process to make a chunky paste. Drizzle in the olive oil and 3 tablespoons water. Process until thick and very smooth, adding a little more water if needed. Season with salt. Spread the dip in a wide, flat serving bowl. Sprinkle lightly with pumpkin pie spice and drizzle with the cranberry reduction. Sprinkle with the pepitas and parsley and serve with crackers on the side for dipping.